There are free and premium WordPress Plugins that allow you to automatically replace your post words into affiliates links. Although I am using MaxBlogPress Ninja Affiliate plugin but there is one more excellent Plugin SEO Smart Links which improves the overall SEO strength of your blog by automatic interlinking your content as well as automatically convert keywords you define into (affiliate) links. It can do much more and if you’d like to skip to the full list of features. Developed by Vladir Prelovac, a known and respected WordPress SEO expert, SEO Smart Links is one of the most popular SEO plugins for WordPress, used by casual bloggers, Internet marketers and SEO professionals. 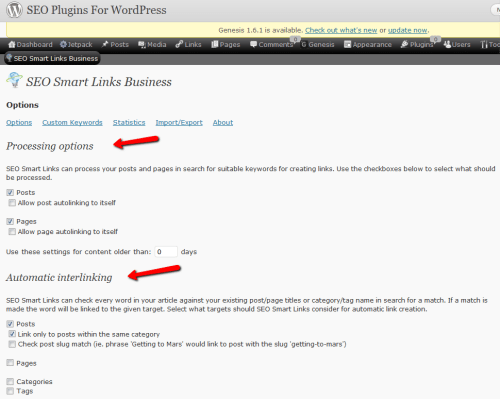 Matt Cutts from Google announced that smart internal linking is one of the key strategies for SEO in 2011. Having been downloaded more than 300,000 times to date, SEO Smart Links Premium has been selected as the best keyword affiliate link plugin. You can find a free version of this plugin at SEO Smart Links, that can do the same job: SEO Smart Links can automatically link keywords and phrases in your posts and comments with corresponding posts, pages, categories and tags on your blog. There is an other simple way to replace words by an affiliate link, all you have to add the following code into your function.php file. This is the simple and free way but have limitations and will not give you as much control as the SEO Smart Link plugin. Don’t forget to enter your words/links as shown in the example code. This code is courtesy of Kevin Chard from WpSnipp, and we should be thankful to him!